Today's dish is completely one of my trial which turned into some fabulous spicy balls. 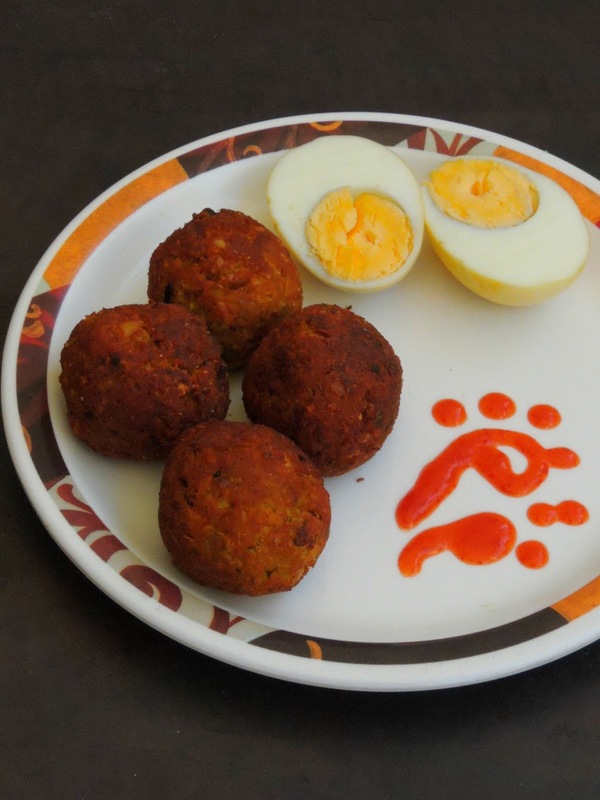 Actually i want to create a kola urundai aka spicy chettinad style balls with eggs since a while. And this week's blogging marathon theme pulled me to come up with this incredible spicy balls. I used boiled eggs to dish out this incredible spicy balls. If you dont have enough eggs to feed your family member, dont forget to give a try to this ultimate balls. With just 4 boiled eggs, you can definitely feed your family members quickly with this egg balls. Everyone at home enjoyed thoroughly these crispy beauties with hot chilly sauce and just loved it. Almost like usual Kola urundais, these egg balls also call for roasted gram powder aka pottukadalai powder along with coconut, poppyseeds and few spices. Obviously you can mix and match the ingredients depending upon your tastebuds. I used green chillies to spice this balls. Apart from it, i didnt made any changes and i sticked with my usual way of dishing out this spicy balls. 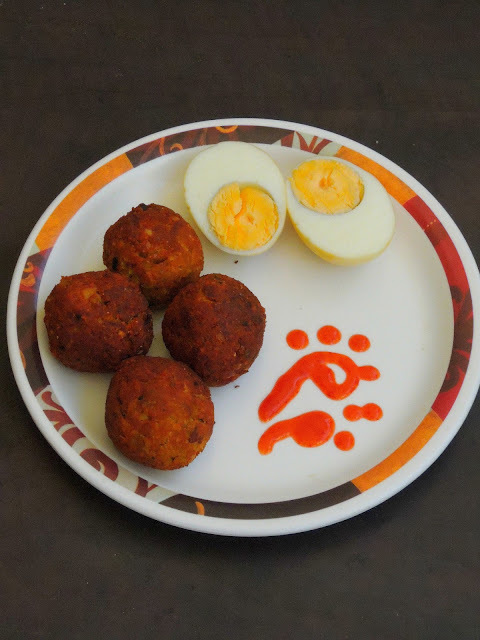 You can even make this balls with steamed egg cubes, since am trying this egg kola urundais for the first time, i dont want to take risk hence i opted for boiled eggs which works absolutely prefect to make these dangerously addictive balls. Am running this week's blogging marathon with All that come round are laddoos as theme, hence am posting this delicious egg balls to stick with the theme. In a pan,heat few drops of oil and saute the chopped onions,chopped green chillies,curry leaves until the onions turns transculent. Remove and keep aside. Grind the poppy seeds,coconut,garlic cloves,fennel seeds with sauteed onions as bit coarse paste. Now chop the boiled eggs and add to the coarse paste and grind everything as a thick paste. Dont add much water, just sprinkle in case if the spices are hard to grind. Grind the roasted gram as fine powder. Now take the grounded boiled egg mixture, roasted gram powder and salt in a bowl. Mix everything well to form a dough.Pinch out medium sized balls from it and keep aside. Heat the oil for deepfrying. Drop the rolled balls to the oil..
Fry in medium flame until they turns golden brown,drain the excess of oil with a paper towel. A household present change may be more private. Mashing the egg and making balls is a cool idea. Love eggs in this new avatar. I like fennel flavour. This looks amazing. I love Spicy Egg Balls. I want to try your recipe. I will knock you when tried . Thanks for share. Oh man these spicy egg balls look and sound sooo yummy. They look so crispy on the outside and absolutely delicious inside. Interesting recipe ! Even though I don’t eat eggs I think this recipe would be a hit with egg lovers . A different way to cook eggs. Looks delicious. Interesting use of egg in these crispy ones. I am sure egg lovers would appreciate these. wonderfully shaped kola urundai again aks:). Must be super flavorful with fennel and poppyseed mixed in. Very interesting version Priya, must have tasted great! Another delicious kola urundai . Loved it.. Egg balls looks and sounds very delicious. Must have been a yummy treat for egg lovers. 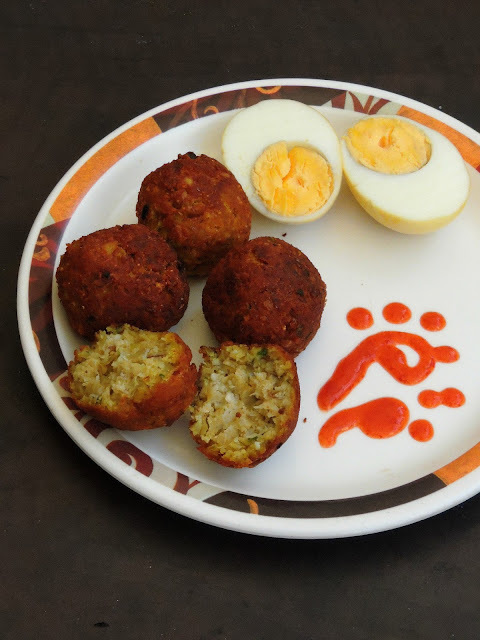 I am sure egg lovers would love your creative egg laddus. That is a nice twist to kola urundai. Looks so yum.. These spicy egg balls certainly caught my eye. So different and flavorful. Worth trying. delicious treat for egg lovers priya ! love the cute ketchup art by the side!!! perfect snack! Very interesting and healthy recipe.